Montana Test.com - Results for: Dakota Decoy X-Treme 6 Slot Honker Premium Decoy Bag! We have not tested yet but have tested decoys and they are outstanding. Review: Dakota Decoy Company headquartered in Vermillion, SD is creators of Dakota X-Treme duck decoys. Here at Montana Test we have used Dakota Decoys X-Treme Mallard decoys the last seven seasons. The name and company may be new to some but these water fowlers have been involved with decoy manufacturing for a long time. All the Dakota X-Treme Mallard decoys are incredibly well built and life like. I never thought after fifty years of water fowling I would call any decoy beautiful but the Dakota Decoys X-Treme Mallard decoys fit that description. When we received the Dakota Decoys X-Treme Mallard to test, I thought they might bust right out of my hands and head south. All Dakota Decoy X-Treme Mallards go through a 24 step painting process and hens a 16-step process and a hand painted finish that gives them the realistic appearance. Each dozen has six different head styles and spin a full 360 degrees and 16 inches long. To date not one of the Dakota X-Treme Mallard decoys has suffered paint loss or chipping and the Dakota X-Treme Mallard decoys take a pounding. All our decoys experience abuse chiefly the Dakota X-Treme Mallard decoys because we utilize them on every trip. If any decoy can take a thrashing that we give them and still look as exceptional as the Dakota X-Treme Mallard decoys you have one durable decoy. We have a communal spot for all our decoys and five separate parties of hunters use during the course of a 3 ½ month season. The Dakota X-Treme Mallard decoys head out on every trip. My son Chris Stinson a former full time fly fishing and hunting guide is a huge cheerleader for the Dakota Decoy X-Treme Mallards and X-Treme Honkers. The real test is do they bring in the birds? The answer to that query is penned in the logs we keep of all your pond and river hunts. We have dispatched well over 350 ducks and geese over the Dakota X-Treme Mallard decoys in one season. A further test is how well they hold up being bounced around in the back of your truck or chucked around in a boat. If they can come out the other side without cracks or paint loss you have an impressive decoy. Weather here in Montana is another test we suffer without any effort on our part. Freezing temperatures test the mettle of any decoy and the Dakota X-Treme Mallard decoys have taken their share. Frozen ice rimmed decoys can fail quickly but so far the Dakota X-Treme Mallard decoys have conquered all kinds of weather without a single failure. The Dakota X-Treme Mallard decoys look authentic on the water and ride extremely well in strong winds. The Dakota X-Treme Mallard decoys rank high on our meter for realism and superiority and we test a bunch of decoys. . We have and will continue to test the Dakota Decoys X-Treme Mallard decoys. Currently we give the Dakota X-Treme Mallard decoys the highest recommendation. The Dakota X-Treme Mallard decoys sell for $179.99 per dozen. Transport 6 X-TREME Honker Fullbody Decoys with Wind Walker Motion Bases Attached! Built tough of Heavy Duty PVC! 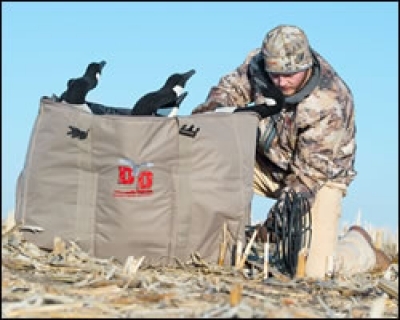 Made to transport, store and protect your decoys!